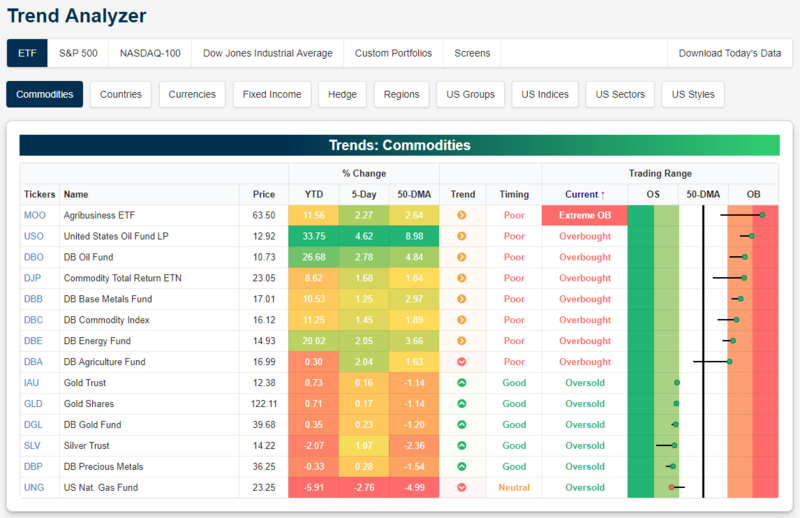 You can quickly pull up trend and timing info for commodity ETFs using our Trend Analyzer tool (available to Premium and Institutional members). Below is a snapshot from the tool as displayed this morning. Interestingly, all of the ETFs are either overbought or oversold, with none in neutral territory. The Agribusiness ETF (MOO) is the most overbought and the only one in “extreme” territory, meaning it’s more than two standard deviations above its 50-day moving average. Next up is the United States Oil ETF (USO), which is right near extreme territory. As shown, USO is up 33.75% year-to-date and it’s 8.98% above its 50-day moving average. USO ranks first in terms of YTD performance and distance above 50-DMA compared to all other commodity ETFs. All of the overbought commodity ETFs are related to oil, agriculture, or base metals. On the oversold side, it’s natural gas (UNG) and all of the precious metals like gold (GLD), silver (SLV), and DBP. 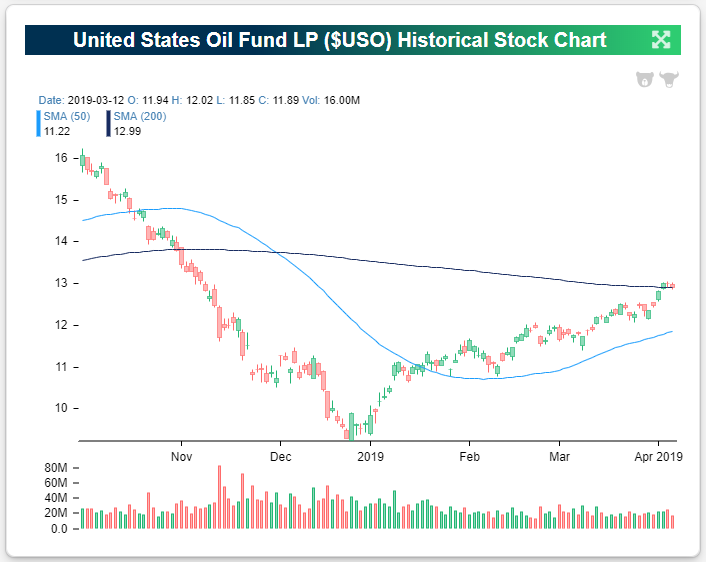 The oil ETF (USO) has been on a tear since it bottomed at the end of 2018. You can pull up charts for ETFs and individual stocks using our Security Analysis tool (available at the Bespoke Institutional level). Below is a quick snapshot of USO from our Security Analysis tool. The chart includes volume as well, and volume on up days is shaded green, while volume on down days is shaded red. Just this week, USO moved back above its long-term 200-day moving average. Compared to the death spiral that USO experienced last year, 2019 has been quite the opposite. Start a two-week free trial to Bespoke Premium to access our interactive research portal. You won’t be disappointed!